Bon Odori was a blast. The STKC wasn't able to meet-up, but I look forward to future festivals and possible meet-ups! You can see my photos from the White River Bon Odori at my personal blog, here, as well as a photo slideshow at the bottom of this news article by the Auburn Reporter, here. The Bon Odori dance lesson's paid off and I had a great time dancing at the festival! 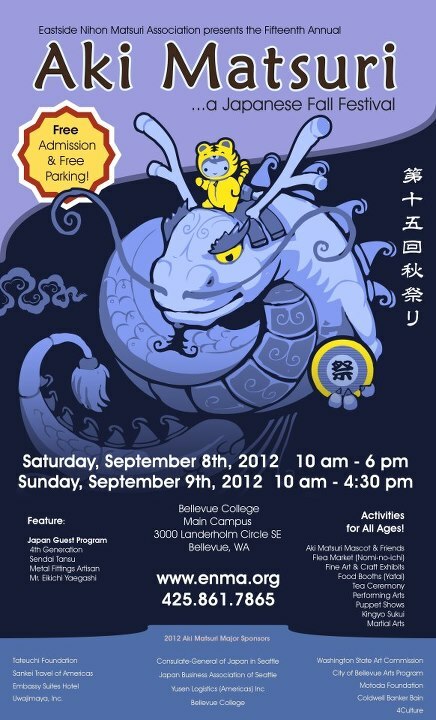 Summer is drawing to a close, as is matsuri festival season. There is one more big festival coming up: Aki Matsuri. Admission and parking are free, but some workshops may require registration. See ENMA's website for a full listing of this year's highlights and schedule. Some things to look forward to: tea ceremony, musical performances (koto, shamisen, taiko, traditional, J-Pop), dance, artisans of various traditional crafts, Japanese flea market, and Mikoshi shrine parade. 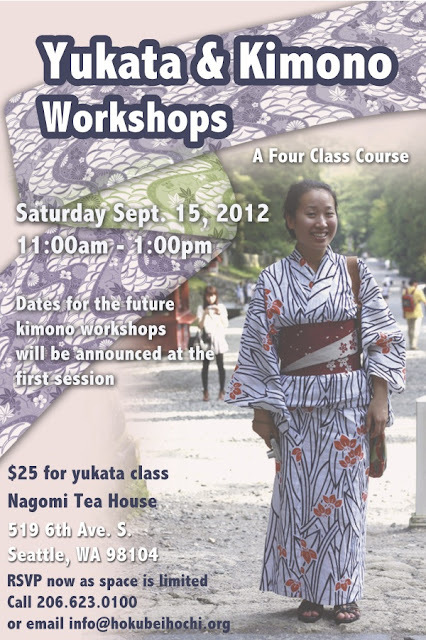 Also, the Nagomi Tea House has announced their first kimono dressing class. Yukata dressing, a two hour class is the first of a 4 part series of kimono dressing classes that will be held until November. $25, registration required. Call 206-623-0100 or email info@hokubeihochi.org. Registration by check or credit card only. Bring what yukata dressing supplies you can (listed below), or you can rent a yukata/obi/koshihimo set for $10, or purchase needed items at the class. Also, bring leggings and a tank top to wear underneath.